Objectives Cognitive dysfunction (CD) is common in systemic lupus erythematosus (SLE) but the cause remains unclear and treatment options are limited. We aimed to compare cognitive function in SLE and healthy controls (HCs) using both behavioural and neuroimaging techniques. Methods Patients with SLE with stable disease and HCs were recruited. Clinical and psychological data were collected along with a blood sample for relevant biomarkers. Neurocognitive function was assessed using tests from the Cambridge Neuropsychological Test Automated Battery (CANTAB) and functional magnetic resonance imaging (fMRI) was used to examine brain responses to working memory (WM) and emotional processing (facial emotional recognition task, FERT) tasks. Results Compared with HCs (n=30), patients with SLE (n=36) scored higher on measures of depression, fatigue and had higher hsCRP (p=0.013), IL-6 (p=0.003) and B lymphocyte stimulator (p<0.001). Patients with SLE had poorer performance on a task of sustained attention (p=0.002) and had altered brain responses, particularly in default mode network (DMN) regions and the caudate, during the WM task. Higher organ damage and higher VCAM-1 were associated with less attenuation of the DMN (p=0.005 and p=0.01, respectively) and lower BOLD signal in the caudate areas (p=0.005 and p=0.001, respectively). Increased IL-6 was also associated with lower BOLD signal in caudate areas (p=0.032). Conclusions Sustained attention was impaired in patients with SLE. Poor attenuation of the DMN may contribute to cognitive impairments in SLE and our data suggest that in addition to mood and fatigue inflammatory mechanisms and organ damage impact cognitive functioning in SLE. The multifaceted nature of CD in SLE means any therapeutic interventions should be individually tailored. Cognitive dysfunction (CD) is a significant problem in systemic lupus erythematosus (SLE), reported to affect up to 90% of patients. The cause is unclear and as such treatment is limited. No consistent measure of CD in SLE. Limited correlations found between structural brain abnormalities in SLE and cognitive function. Increasing interest in the use of functional magnetic resonance imaging (fMRI) in the assessment of cognitive function in SLE. One of the largest fMRI studies in SLE. Addresses the multifactorial nature of CD in SLE. Excludes patients with neuropsychiatric SLE (NPSLE) with the aim of examining the milder cognitive deficits reported by the majority of patients to address the concept of ‘brain fog’. Indicates that SLE-specific factors (e.g., inflammation, disease damage/duration) are associated with CD as well as chronic disease factors (e.g., fatigue, depression, pain, medication). Increases awareness that CD in SLE has multiple drivers and therefore treatment should be individually tailored. Helps in the development of a biomarker of CD in SLE. Aids future clinical trials by highlighting which key factors should be included in the study design. Highlights that patients with SLE are likely to employ compensatory brain mechanisms to maintain cognitive performance. As such patients may score similarly to healthy controls of objective measures of cognition but may fatigue quicker. This needs to be taken into consideration in any clinical trials or clinical assessments. CD is common in other chronic conditions, such as inflammatory bowel disease and multiple sclerosis3 and factors associated with chronic disease such as mood disorders, medications and fatigue can all affect cognition. Specific SLE-factors are also hypothesised to play a role,4 with reported associations between autoantibodies and CD, particularly anti-N-methyl-D-asparate, anti-dsDNA and antiphospholipid (aPL) antibodies.5 Structural brain alterations in SLE such as cerebrovascular events, and the increased number of white matter hyperintensities6 also may contribute, although others have suggested that such structural changes are not directly associated with CD. As such, clinical and imaging biomarkers of CD in SLE remain elusive. The American College of Rheumatology (ACR) established a recommended battery of cognitive tests but these require a trained professional to administer. An alternative is the Cambridge Neuropsychological Test Automated Battery (CANTAB), a tool that can assess changes in cognition over time, has been validated in many clinical settings, requires minimally trained administrators and has been successfully used in SLE.7 Another objective approach is functional magnetic resonance imaging (fMRI). fMRI gives a proxy measure of neuronal activation during cognitive testing. To date, only a few articles have reported fMRI findings in SLE but they suggest that patients with SLE may employ compensatory mechanisms within the brain to maintain adequate cognitive performance.8 Even fewer studies9 10 have examined cognition in SLE using a combination of behavioural, functional and structural assessments, although such an approach may better help identify causes and targets for therapy. We aimed to compare cognitive function between patients with SLE with stable disease and HCs using CANTAB and fMRI. Variables that are known to affect cognition were also examined with differences between the two groups reported. Patients with SLE were recruited from Rheumatology departments at Manchester University NHS Foundation Trust Hospitals. HCs were recruited via study participants (e.g., friends) and social media. All SLE participants fulfilled ACR 199711 or Systemic Lupus International Collaborating Clinics (SLICC) criteria12 for SLE and were considered clinically stable if no change of treatment was required, and their Systemic Lupus Erythematosus Disease Activity Index-2000 (SLEDAI-2K) score was ≤4.13 Participants with a history of epilepsy, stroke, severe depression/psychiatric conditions or certain central nervous system (CNS)-acting medications were excluded. Severe depression was defined as currently receiving treatment and/or scoring ≥20 on the Montgomery Asberg Depression Rating Scale (MADRS). Participants on low-dose CNS-acting medications or who were taking no more than three such medications (and only if being used to treat conditions other than depression, such as fibromyalgia) were included. Disease activity was assessed using the British Isles Lupus Assessment Group Index BILAG 200414 and SLEDAI-2K, and organ damage using the SLICC/ACR Damage Index (SDI).15 Specific biomarkers of the inflammatory response activation (B lymphocyte stimulator (BLyS), high sensitivity C reactive protein [hsCRP], interleukin 6 (IL-6)) and vascular/endothelial (vascular cell adhesion molecule-1 (VCAM-1), vascular endothelial growth factor (VEGF)) were measured. Visual memory and new learning (PAL: Paired Associates Learning). Immediate and delayed verbal memory (VRM: Verbal Recognition Memory). Emotional processing (ERT: Emotional Recognition Test). Sustained attention (RVP: Rapid Visual Information Processing). Executive function (OTS: One Touch Stockings). Spatial working memory (SWM: Spatial Working Memory). Two functional scans were performed using a 3.0 Telsa Philips Gyroscan ACS NT (Philips, Best, NL) MR scanner while participants completed a WM task (n-back) and a facial emotional recognition task (FERT). Two structural scans were also performed: a fluid attenuated inversion recovery and T1-weighted magnetisation-prepared rapid gradient-echo. All behavioural and assessment data were analysed using independent t-tests for parametric data, Mann-Whitney U tests for non-parametric data and χ² for proportional data in SPSS 22 and group region of interest analyses were undertaken for the fMRI data using SPM12. To examine any possible associations between SLE and CD exploratory Pearson/Spearman’s correlations and χ²s were undertaken using the SLE group only. These correlations were only conducted using the CANTAB tasks, structural brain abnormalities and fMRI results that were significantly different between the HC and SLE groups. These variables were assessed against factors proposed to affect cognition, including disease duration, disease activity, damage, medication use, aPL/LAC as well as measures of depression and fatigue. Further details on all methods can be found in the online supplementary data. The SLE group were typical of a stable SLE cohort (table 1) and both groups were matched on age, gender, handedness and ethnicity; patients with SLE had fewer years in education and a lower mean IQ (table 2). The SLE group had higher depression scores (medians within the normal ranges). For each group, the percentages of participants that scored within the mild clinical ranges for depression/anxiety were: MADRS 0% HC, 6% SLE, BDI-II 6% HC, 33% SLE, HADS-D 3% HC, 39% SLE and HADS-A 20% HC, 39% SLE, despite excluding for clinical depression. The SLE group also had higher levels of motor and cognitive fatigue with median scores in the ‘severe’ (motor) and ‘moderate’ (cognitive) fatigue categories. Several biomarkers of inflammation and endothelial activation showed statistical difference between the two groups (table 2). All measures of depression positively correlated with both cognitive and motor scores of fatigue (FSMC) and negatively with years in education (see online supplementary table S1). In addition, hsCRP positively correlated with HADS-depression score (rs=0.43, p=0.013). From the 66 participants (36 SLE and 30 HC) who underwent CANTAB testing, 2 SLE participants did not complete all tests due to fatigue. The SLE group performed less well on the RVP task (a test of sustained attention) compared with the HC group (13 [12, 20] vs 20 [15.75, 22], p=0.002). Compared with the normative data available from CANTAB 33.3% of the SLE participants scored one or more SDs below the RVP mean, whereas only 1% of HC group scored one or more SDs below the mean. The SLE group was also slower to identify emotions from the ERT task and identified more of the emotions incorrectly compared with HCs (p=0.012 and p=0.019, respectively) (table 3). Structural analysis was conducted on 53 participants (30 HC and 23 SLE). The SLE group had significantly more and larger perivascular spaces (PVS) in the centrum semiovale (CSO-VRS), χ2=15.50, p<0.001. The differences between the SLE and HC group for the PVS in the basal ganglia (BG-VRS) did not reach significance, χ2=8.96, p=0.077 (see online supplementary tables S2-S4). Not all patients underwent an MRI scan due to scheduling, discomfort and artefact issues. Overall, 23 SLE and 29 HC participants had fMRI scan data available for analysis. Patients with SLE performed worse than HCs on the 0-back level (measure of attention, p=0.008) and were also slower to respond correctly on the 1-back and 2-back levels (measures of WM, p=0.019 and p=0.025, respectively) compared with the HC group (see online supplementary table S5). ROI analysis revealed significant results for the negative effect of the 2-0back condition. This condition highlights regions where the BOLD signal reduced for both groups during the WM task. Significant results were found in the left transverse temporal gyrus (t=2.12, p=0.039), right superior temporal gyrus (t=2.09, p=0.041) and right caudate (t=−2.45, p=0.018). The left caudate (p=0.058) also showed a similar BOLD response to the right caudate. Results in the left transverse temporal gyrus (LTTG-WM) and right superior temporal gyrus (RSTG-WM) showed a more decreased BOLD response for the HC group compared with the SLE group. In the caudate the reverse was found, the SLE group had a more significant decrease in BOLD signal (figure 1). No significant differences between the groups were found for the positive effect of the 2-0back condition. Significantly different BOLD responses for the SLE and HC groups for the n-back task, 2-0back, negative effect of task. HC, healthy control; SLE, systemic lupus erythematosus. 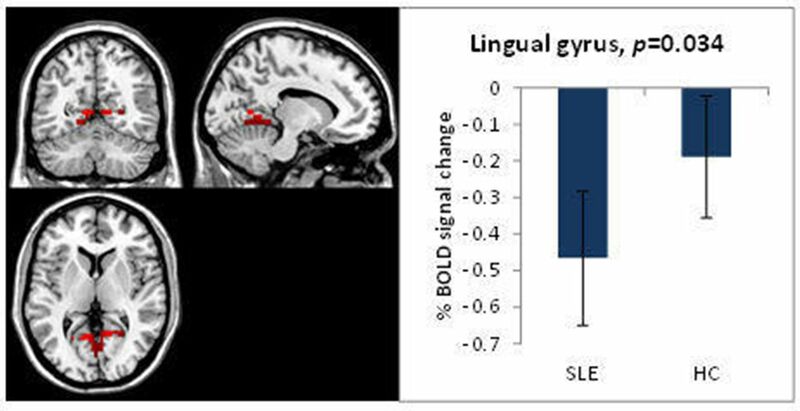 Using ROI analysis, the SLE group had a greater decrease in signal in the lingual gyrus compared with the HC group (figure 2). No significant differences between the groups were found for the positive effect of the 0back-rest condition. Significantly different BOLD response in the lingual gyrus for the SLE and HC groups, for the n-back task, 0back-rest, negative effect of task. HC, healthy control; SLE, systemic lupus erythematosus. Behaviourally, the SLE group was slower to correctly determine whether a face was female or male when displaying sadness (p=0.035) (see online supplementary table S6). 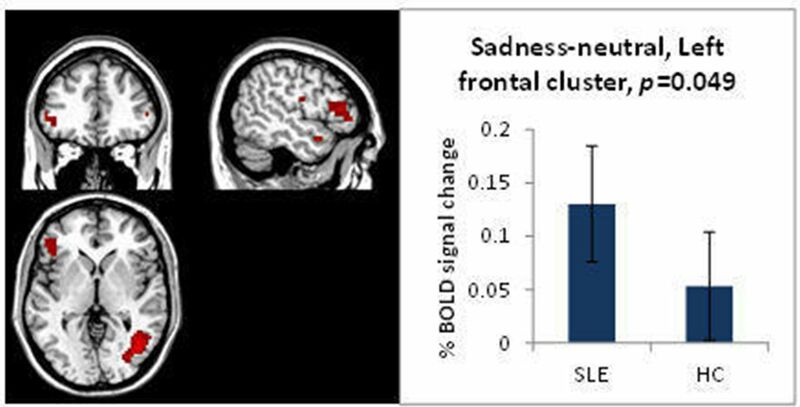 In an ROI analysis, in the sadness-neutral condition, the positive effect of task for this condition showed that the SLE group had an increased BOLD response in frontal areas compared with the HC group (figure 3). There were no differences in the BOLD responses for the negative effect of task. Significantly different BOLD response for the FERT, sadness-neutral, positive effect of task, SLE vs HC. FERT, facial emotional recognition task; HC, healthy control; SLE, systemic lupus erythematosus. Improved performance on the attention task negatively correlated with the signal in a default mode network (DMN) region during the WM task (RVP associated with the RSTG-WM, r=−0.60, p=0.003). Better performance on the emotional processing task negatively correlated with the signal in a DMN area during a WM task (ERT average percentage correct associated with the RSTG-WM, r=−0.72, p<0.001). Also, the mean response latency for the identification of the emotions in the emotional processing task negatively correlated with the signal in a cognitive region during the WM task (ERT overall mean response latency associated with left caudate-WM, r=−0.51, p=0.013), implying a greater response in the DMN when performing better and quicker on an emotional processing task. Structurally, the enlarged PVS in the centrum semiovale (CSO-VRS) and basal ganglia (BG-VRS) were associated with years in education (rs=−0.48, p=0.022 and rs=−0.45, p=0.035, respectively). Neither was associated with vascular biomarkers including LAC or aCL positivity, or VCAM-1. The DMN areas (left transverse temporal gyrus and right superior temporal gyrus), areas that are usually attenuated during cognitive tasks, were positively correlated with depression (LTTG-WM with MADRS, r=0.45, p=0.036), VCAM-1 (with RSTG-WM, r=0.53, p=0.01), SDI (with RSTG-WM, rs=0.56, p=0.005) and current use of biological medication (with RSTG-WM, r=0.60, p=0.003). The cognitive areas (right and left caudate) were negatively correlated with IL-6 (with the right, rs=−0.47, p=0.032), VCAM-1 (with the left, r=−0.65, p=0.001), SDI (with the left, rs=−0.57, p=0.005), disease duration (with the left, r=−0.49, p=0.019) and current use of biological medication (r=−0.52, p=0.011). The left caudate was positively correlated with cognitive fatigue as measured by the FSMC-Cognition score (r=0.43, p=0.047). Also, the right caudate was positively correlated with aCL positivity (r=0.51, p=0.015) but not with LAC positivity. The attention condition of the n-back task, in the visual attention region of the lingual gyrus, positively correlated with the BILAG total score (rs=0.45, p=0.033), IL-6 (rs=0.44, p=0.036), current use of immunosuppressant (r=0.48, p=0.019) and antimalarial medication (r=0.47, p=0.028) and negatively with BG-VRS score (rs=−0.46, p=0.030) suggesting that higher inflammatory disease activity increased responses in an attentional brain region during an attention task. The BOLD response to sad faces from the FERT task in the left frontal cluster negatively correlated with the SDI score (rs=−0.57, p=0.005) and disease duration (r=−0.43, 0.047). We have identified structural, cognitive and fMRI differences in patients with SLE. While overall cognitive function was comparable between groups, the SLE group was less accurate on a test of sustained attention. Anatomically, we found increases in the PVS in the centrum semiovale in 43% of SLE participants and no controls. Using task-based fMRI, there was significant interference in emotional tasks and a reduced ability of patients with SLE to suppress the DMN during cognitive tasks. Our data support previous work showing that attention is the most common cognitive problem in SLE.4 Such attention deficits can result in problems with other cognitive functions, such as WM although in this study we did not find any other non-emotional cognitive problem in the SLE group. A more detailed assessment of these relationships was limited due to time constraints with testing; however, follow-up studies focusing on these key inter-relationships are planned. The 0back-rest condition of the fMRI n-back task is a neuronal marker of sustained attention. Patients with SLE had a larger task-negative BOLD response in the lingual gyrus compared with the HC group. This region has been associated with visual attention, visual encoding/processing and WM.23–25 This may explain why our SLE group performed worse on the behavioural (CANTAB) attention task. The few studies published using fMRI in SLE have suggested that patients with SLE employ compensatory brain mechanisms to maintain cognitive function.8 Our cohort may have failed to recruit compensatory mechanisms on the challenging sustained attention task, resulting in performance deficits. Exploratory analyses also found that the response to attention in the lingual gyrus negatively correlated with an increase in PVS in the basal ganglia. Previous studies have found patients with SLE to have a greater number and larger PVS in the basal ganglia which did not reach significance in our study; we did however find differences between the HC and SLE in PVS in the centrum semiovale. PVS is an imaging marker for cerebral small vessel disease;26 27 however, we did not find any correlations between several serological markers of vascular disease (LAC, aCL antibodies and VCAM-1) and CSO-VRS, although we did exclude patients with severe vascular disease. On the CANTAB battery, there were no differences between groups for the behavioural WM tasks. 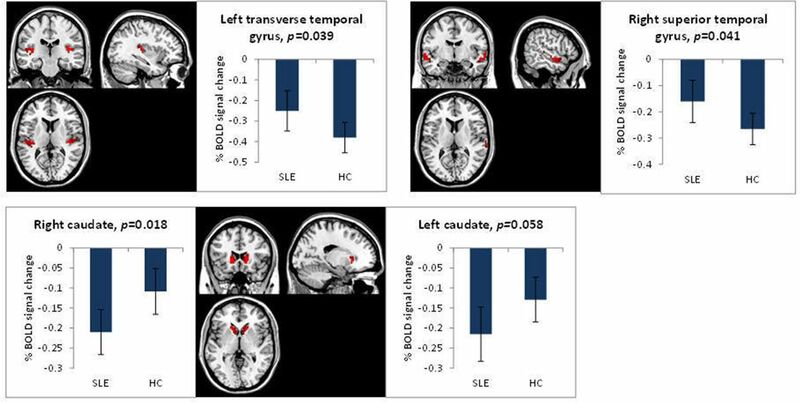 However, on fMRI patients with SLE had less task negative BOLD signals in the left transverse temporal gyrus and right superior temporal gyrus. These areas are part of the DMN, which is usually inactive during cognitive tasks28 and active during rest and internal processes, such as self-reflective processes and planning.23 28 The limited ability to reduce these signals in SLE implies an inability to inhibit self-reflective processes which can impede performance on cognitive tasks that do not usually have an emotional component, by allowing emotional interference from self-reflection and worries about task performance.29 In support of this, the FERT fMRI task found that patients with SLE had a greater response to viewing sad faces in frontal regions compared with the HC group. Such increased responses to sad expressions is also associated with depression.30–32 Similarly, patients with SLE were less accurate in correctly identifying emotions on CANTAB and showed evidence of reduced response latency implying a level of psychomotor slowing, both of which are associated with depression32 33 and may contribute to some of the differences observed between groups. This is despite our groups scoring within normal ranges on the depression scales and that major depression was an exclusion criteria. We therefore cannot rule out the potential impact mood may have on cognitive performance in this SLE group even at the subtle end of the scale. Also, we recruited a low disease activity cohort and excluded NPSLE cases, so there may be different subtypes depending on CD severity. We also noted differences in the caudate between the two groups. Patients with SLE had a larger task negative response compared with the HC group. The caudate, via the network linked to the dorsolateral prefrontal cortex, has been implicated in WM34 but usually as an area with an increased BOLD response during WM tasks. The attenuated response we found is in contrast to Mak et al who noted, using a different executive function task, an increased BOLD response in the caudate body from patients with SLE.35 It is therefore unclear if the differences we found are task specific and why our findings were in a task negative direction. In patients with SLE, we have noted impairments in sustained attention while other non-emotional cognitive functions remained unaffected. Poor attenuation of the DMN may contribute to CD in SLE, although prospective studies may be needed to confirm this, and our data suggest that in addition to mood and fatigue, inflammatory mechanisms and organ damage impact cognitive functioning in SLE. Clinically, this study has implications when advising patients about CD in SLE. It has highlighted the multifaceted nature of CD in SLE and that future therapeutic approaches will need to be individually tailored to address the relevant drivers in individual patients. This research was funded by the NIHR Manchester Biomedical Research Centre and cofunded by an unrestricted grant from Sanofi Genzyme. It was carried out at the NIHR Manchester Clinical Research Facility. The work in this manuscript was supported by infrastructure support from the Arthritis Research UK Centre for Epidemiology (grant reference 20380).
. A meta-analysis of serum and cerebrospinal fluid autoantibodies in neuropsychiatric systemic lupus erythematosus. Autoimmun Rev2016;15:124–38.
. Functional MRI of working memory and executive dysfunction in systemic lupus erythematosus and antiphospholipid antibody positive patients. Arthritis Care Res2016.
. Systemic lupus erythematosus disease activity index 2000. J Rheumatol2002;29:288–91.
. Evaluation of predictive factors for neurocognitive dysfunction in patients with inactive systemic lupus erythematosus. J Rheumatol2000;27:2367–71.
. Manual for the Beck depression Inventory-II. San Antonio, Texas: Psychological Corporation, 1996.
. Numerical scoring for the classic BILAG index. Rheumatology2010;48:1548–52.
. Fatigue and cognitive function in systemic lupus erythematosus: associations with white matter microstructural damage. a diffusion tensor MRI study and meta-analysis. Lupus2016.
. Enlarged perivascular spaces as a marker of underlying arteriopathy in intracerebral haemorrhage: a multicentre MRI cohort study. Journal of Neurology, Neurosurgery &amp. Psychiatry2013;84:624–9.
. Dilatation of the Virchow-Robin space is a sensitive indicator of cerebral microvascular disease: study in elderly patients with dementia. AJNR Am J Neuroradiol2005;26:1512–20. Presented at Barraclough M, Elliott R, Parker B, McKie S, Jackson A, Pemberton P, Bruce IN. Altered cognitive function in systemic lupus erythematosus and associations with inflammation and functional brain changes [abstract]. Arthritis Rheumatol. 2018; 70 (suppl 10). https://acrabstracts.org/abstract/altered-cognitive-function-in-systemic-lupus-erythematosus-and-associations-with-inflammation-and-functional-brain-changes/. Contributors All authors were involved in some/all of the following: substantial contributions to the conception or design of the work or the acquisition, analysis or interpretation of data for the work; drafting the work or revising it critically for important intellectual content; final approval of the version to be published; agreement to be accountable for all aspects of the work in ensuring that questions related to the accuracy or integrity of any part of the work are appropriately investigated and resolved. Funding This research was funded by the NIHR Manchester Biomedical Research Centre and co-funded by an unrestricted grant from Sanofi Genzyme (GZ-2011-10813). Competing interests This study was partially funded by an unrestricted grant from Sanofi Genzyme and supported by the Manchester Academic Health Sciences Centre (MAHSC), NIHR Manchester Biomedical Research Centre and NIHR Manchester Clinical Research Facility. Ethics approval This study was approved by the National Research Ethics Service (NRES) Committee North West—Cheshire, 11/NW/0090. Data sharing statement Data are available on request. Data may be available if compliant with ethical and GDPR regulations and our funders and employers policies. For data queries, please contact one of the authors.